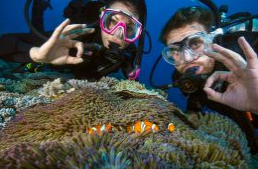 One of the "must do" things in Queensland is to dive on the Great Barrier Reef. 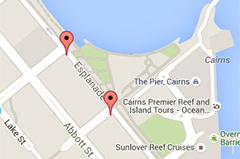 They are Cairns premier dive school and outer reef live aboard dive trip operator. Since 1983 they have developed an international reputation for quality, professionalism, safety and value. They specialize in all levels of dive education. 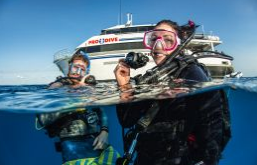 This company only offers the PADI Open Water Certification as a 5 day course. You complete 2 days of pool and theory at their training centre, and then go out on their luxurious live aboard vessel for 3 days and 2 nights. The great advantage to doing it this way is that you get night dives and pleasure dives, which will give you greater confidence. Their dive courses and trips include many exclusive features that you won't find elsewhere. These include an all inclusive price, the best boats, a more personalized experience and a greater variety of dive sites visited. If your thinking about taking the plunge their modern diver training centre combined with 3 modern purpose built live aboard dive boats provide the best facilities available. All vessels are fully air conditioned, offering comfortable and spacious living conditions with double or twin share accommodation. This 5 Day PADI Open Water dive course has it all... The adventure of staying out on the reef for 3 days and 2 nights and the 5 extra recreational dives makes this course unmatched for experience and value. Here you learn the basics of scuba diving, both classroom and pool, at a modern, purpose built dive training centre in Cairns. At the end of day 2 your course includes the option of attending "Reef Teach" a 2 hour marine biology presentation. 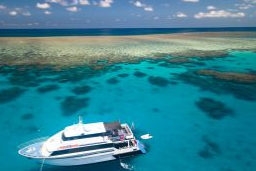 You spend out on the reef on one of their premium custom built live aboard dive boats. You will have the opportunity to do 9 dives in total. Your first 4 training dives will complete your certification then 5 additional recreational dives to enjoy your new skills and gain some experience. 1 of these 5 dives is a guided night dive. On the night of day 5, after your return from the reef you have the opportunity to join the crew from your trip for a farewell dinner at a local restaurant. Courses commence - English - Every day except Sunday. German - Tuesday and Friday. Japanese - Thursday. On the boat - 2 nights twin share accommodation, all meals and bed linen. Dive medical (AS4005.1) are required only for those with an at risk medical condition, or over 45 years of age, or those with a BMI (Body Mass Index) over 30 and a waist circumference greater than 102 cm for males and 88 cm for females. The cost for a dive medical is approximately $60 pp if required. Please contact us for more information is you have any medical concerns, medical conditions or are taking any medications. You can cancel your course up to the end of day 1 of the course and get a full refund. There is no refund for any reason after this time.